Almost a year after the end of the Kosovo conflict, South Eastern Europe remains a volatile, insecure and economically depressed region. Post-conflict reconstruction has not spurred growth, unemployment has risen and security tensions in Kosovo and Montenegro persist. Bosnia and Herzegovina remains an aid-dependent country, Albania has yet to establish effective statehood, while Bulgaria, Romania, FYR Macedonia and Croatia continue to make efforts to spur indigenous and sustainable economic growth. There are clearly differences in the situations of the individual countries, yet the region as a whole is viewed as an unstable and insecure place to do business and invest in. The EU-sponsored Stability Pact for South Eastern Europe is a potentially far-reaching initiative but has yet to deliver practical results that will boost morale and economic development on the ground. EU integration, although offered as prospect, remains distant. Intra-regional co-operation, so necessary for creating a common, larger market, is hampered by the lack of a shared regional vision of the future of South Eastern Europe. The EastWest Institute launched in 1999 an Action Network for South Eastern Europe (ANSEE) to address some of the above problems. ANSEE is a cross-border initiative consisting of a cluster of related projects, which aims at encouraging regional approaches to economic and civic development in South Eastern Europe. Projects address issues concerning private sector development, strengthening democracy and civil societies, building a regional security framework, and promoting transfrontier co-operation. ANSEE endeavours to facilitate close co-operation among the governments of the region and create new channels of communication among policy-makers, regional and non-governmental players. The most important objective of the initiative is to help prepare the countries in the region for integration into larger European structures. 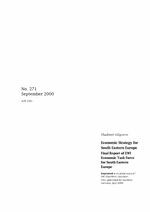 This report looks at the current economic challenges facing South Eastern Europe and analyses their deeper causes. It argues that the fundamental problem the region faces is generating sustainable development in the circumstances of transition and, in some cases, overcoming state failure. This requires policies that address the main aspects of under-development, while preserving and nurturing the human capital in the region. The report offers some broad and some concrete policy recommendations on how to overcome the obstacles to economic development, lower the barriers to trade and investment in the region, and speed up integration with the EU. It is far from prescribing a cure-all medicine. The analysis tries instead to put the right diagnosis on the problem and stimulate the thinking and action of domestic and international policymakers on how to revitalize the human potential and the economic promise that the region holds.